Actually, not much of a case. Someone took it, and we didn't catch them. So this is more of the story of discovery, Working with Good and bad mechanics, figuring out what to do, and getting replaced. In March, we visited RoadAbode to get ready for our first trip of the season. We are always excited, because, well - first trip of the season, and we almost always head to our "home" campground. We call Country Acres our home campground because it's only an hour away, and we usually camp there first and last trips of the season. We have a basic checklist of things to do. Check battery, look for leaks or pest infiltration, and start RoadAbode up. Usually when I start RoadAbode, even first time of the season, all I do is walk up from the house part, bend over, stick the key in the ignition and give a turn. Don't even need to touch the pedal and the fuel injectors do the rest. This time instead of the usual low throaty rumble we usually hear when I turn the key, we were greeted with a terrifyingly loud roar as the engine came to life. LOUD ROAR. Amy was putting linens away in our bedroom. Our eyes met and said everything in that knowing couples look. "THAT ain't good!" I quickly shut down the engine, fearing something was wrong with it. Hopped out and laid down on the ground and took a look. Sure enough, something was missing. 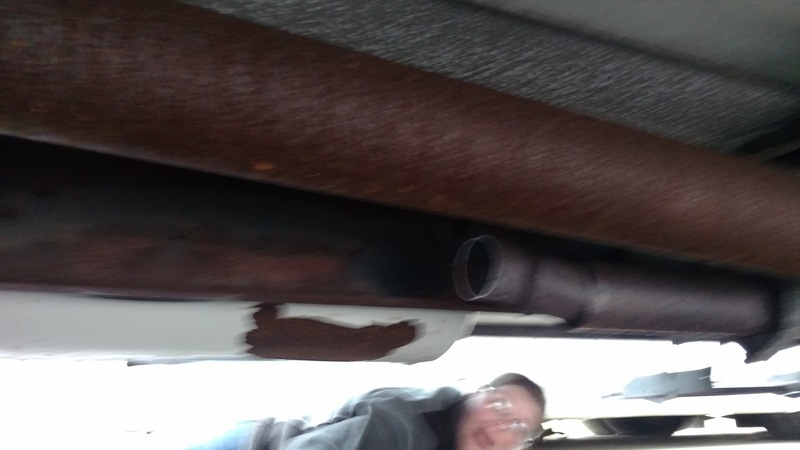 "Hey Am, someone took part of our exhaust pipe!" I bellowed incredulously from underneath RoadAbode. I laid there on my back , ticked, wondering why someone would cut a four foot piece of exhaust pipe out from under an RV. The other part that was upsetting is that though I had not visited RoadAbode In January and February as I usually do (busy at work with travel) Our storage place is behind a gated facility - with codes to get in. We packed up and headed home still thinking why someone would cut out a four foot piece of pipe when I came to realization someone had not cut out just exhaust pipe - it was our catalytic converter! What's missing? A Catalytic Converter! 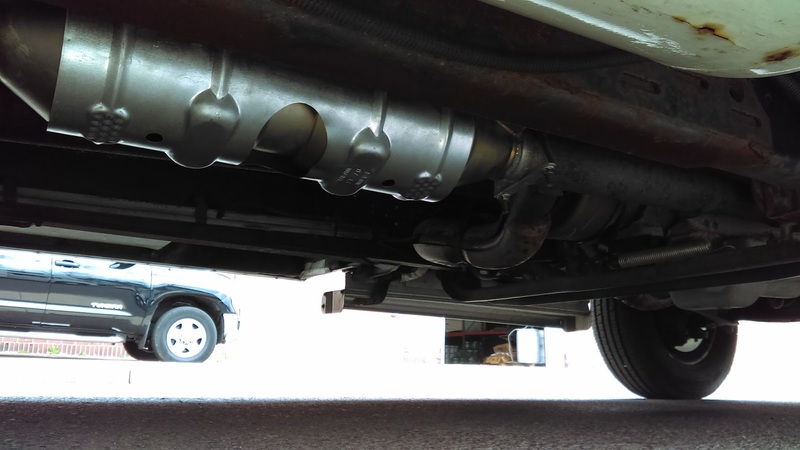 I was not totally aware that removing catalytic converters from vehicles was a "thing" , but a quick Google confirmed the the metals found in the part are what make it an easy target for unscrupulous scrappers to make into quick cash. Now that I identified what was missing, I had to find out if we could get it fixed before the next weekend. Then I remembered "hey, there is a truck repair place right next door" - convincingly called Jim's Truck Repair - they could probably fix it, and I wouldn't have to drive too far either. I called and spoke to what I believed was the owner, and though not 100% thought he could do the repair, but not by next weekend. So still a plus, I asked for an estimate. He asked for the Make/model, and would get back to me by end of day. Next day, I called in the afternoon since I had not heard back. An older, perhaps gruff sounding gent answered the phone, told me to hold on - and sounded like he threw on the counter - maybe even clattering to the floor. The owner got on the line after some time, and apologized for not getting back, but that he needed the VIN number as well. I said I needed to hunt that down, and asked If we could meet up at RoadAbode so he could take a look. He stated the next day at around noon or 1pm would be good for him. I let him know I needed to check with my boss, but would call back as soon as I got the VIN. Later that day I found the VIN in some paperwork, and called back. Mr McGruff answered. I had to repeat to him a several times the long sequence of numbers, either because of my speech impediment (I don't have one) or a bad phone line, or perhaps his short attention span to inane things like letters and numbers. I let him know that I still didn't know what time I could meet up with Jim (had not heard back from my boss yet) Mr McGruff bellowed into the phone "I don't know what's the BIG DEAL about meeting and gettin' him to look at this thing? It's sittin' RIGHT NEXT DOOR!" Taken aback I stopped for a moment, then proceeded to let him know that I work during the day, and to meet on Jim's schedule I needed to get approval to get the time - does that make sense?!? He grumbled yes into the phone and hung up. Later I called that I could meet the next day, Jim answered, and said no problem. Next day I picked up Jim at the front gate, and took him to RoadAbode's spot. He took pictures, and measurements saying it seemed like he could refit a catalytic converter in. I drove him back over to his garage, and he said he'd call me with an estimate. Two day's later I hadn't received a call, and called there. "Are ys' sitting down? Mr. McGruff chuckled into the phone it's gonna be $2500 dollars! I thanked him and said if I would call back if I wanted done. Amy canceled our March reservations, and kindly Country Acres let us reschedule at no loss for April. I Googled the part and found that the Catalytic converter alone was $350-$400 dollars, depending on what site I visited. I decided to call Bergey Truck Center - who up to this point has done all my yearly work and inspections. Since RoadAbode is a Ford, I was referred to the Bergey Ford Shop. The gentleman there was very helpful, and told me he would get a price, but he believed that since they were a Ford Service Center, that they would have to do replace from the headers by the engine block, all the way to the muffler. He called back in a few hours with a price of $2900, and confirmed that would be from the headers to the muffler. He also stated what I was already thinking. If it was his, he's get the part and get a muffler shop or independent garage to weld the part in. At this point, I ordered the part online including shipping for $371 and figured I would find someone who could weld it on. Bought it - Can I get it installed? I knew I had until April to find a place to get the new catalytic converter installed. Just needed the time to call around, get prices and find places willing (and big enough for RoadAbode) to install my aftermarket part. Unfortunately, I now was travelling more for work, which afforded me little time to lookup and call places. It was a bit fustrationg - and stressing too. That's When Amy came to the rescure! While I was in LA for work, she managed to find a place that was only a few miles from RoadAbode, and could weld in the part. 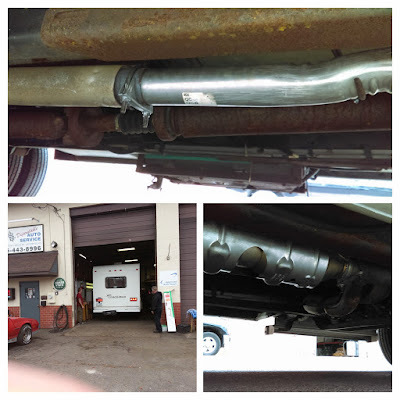 So without letting me know she drove RoadAbode to Dependable Auto Service in Hatboro, There, they treated her very well and showed here what they needed to do, and took pictures for her to boot. I think we found a new dependable place for future RoadAbode work! How'd We Get to Here?